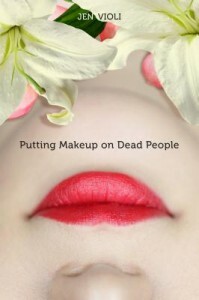 If you have not yet discovered the lovely work of Jen Violi, you’re in luck: her acclaimed first novel, Putting Makeup On Dead People — about a girl named Donna who disconcerts her friends and family when she realizes she wants to become a mortician — is now out in paperback. You’re also in luck if you have a book of your own that needs some help, or if there’s anyone in your life (including yourself!) who could benefit from a love note. 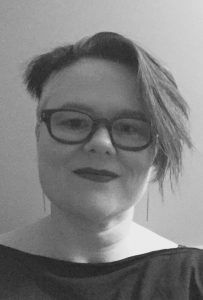 To mark PMODP’s paperback debut I asked her some questions, which she kindly answered below. SR: What was the first spark of the idea for PMODP? Also, how would you suggest pronouncing PMODP? JV: Well the first spark for PMODP went off in late summer, 2005, just as Hurricane Katrina was brewing—I’m not sure how to feel about that connection. Part of me hopes that PMODP was generating an equally powerful creative, rather than destructive force, to balance things out. Regardless, the spark was a short story, in which I first met Donna. In that incarnation, she was thirty-something and realizing she wanted to be a mortician. I dug into that short story that fall, while I was in Dayton, OH, evacuated from my then home in New Orleans. After that, I couldn’t stop writing Donna stories. As for pronouncing PMODP, I’m thinking Pamodpa, which actually sounds like some sort of ancient blessing/salute/festival, don’t you think? So Sara, a fine Pamodpa to you. SR: What was your research process like for the book? JV: Just after I started writing about Donna and her mortician urges, I got a message from Suzanne, a former student who was writing to let me know she had decided to start mortuary school. I love synchronicity! So Suzanne became my go-to person for research. We had long phone and email conversations about smells and visuals and all kinds of things I would never want to do myself. Beyond that, I grew up knowing loss first hand, particularly the loss of my own dad as I started high school. So as a young person, I spent lots of time in funeral homes. That setting and all of the feelings and thoughts and experiences that went with it got into my system, and finally found a productive outlet in PMODP. SR: At what point did you decide to include the notes about the various different funerals? My favorite part in those is “Dumbest thing someone says in an attempt to be comforting.” Did you start with any real-life inspirations for people saying similarly dumb things? JV: The death notes was a brilliant idea from my brilliant editor, Tamson Weston. And it gave me a great forum to unleash more of that funeral home stuff I mentioned above. Some of it certainly came from real life experiences. For instance, I developed a special loathing for the statement, “Everything happens for a reason.” As someone who watched her dad die of bone cancer resulting from the immune deficiency that came from the Lupus that plagued him for ten years, I found it not the least bit comforting to think that God (who was identified as the most likely suspect at the time) would have given my dad those diseases for a reason that somehow made them worth it. Crappy, hard stuff happens, and I don’t think there has to be a good reason. What I think is more important is the meaning and the framing we can give to events after they happen. For instance, I could have chosen to be a victim of loss my whole life, but instead, I choose to be someone who can find the transformation and healing possible after experiencing loss. SR: Your book makes a very strong case for the importance of rituals in helping people to get from one mental/emotional space to another. Did you perform any rituals while writing it, and/or do you have any to recommend for others? JV: Rituals are crucial to my well being. For me, a ritual is very basically bringing awareness and intention to a moment or an action; it’s a reminder that I’m entering sacred space. For instance, when writing the final version of PMODP, I always started writing time by listening to the soundtrack from Slumdog Millionaire. Jai Ho, from the Slumdog Millionaire soundtrack. Even now, when I hear those songs, I get a little buzz, an urge to create. As I worked on it, before I started working with my wonderful agent, Jason Anthony, I often also lit candles and held the intention that my book would find its way out into the world. I suppose we could say that worked. Or at least it didn’t hurt! And I still explore the connection between ritual and writing. Rite and write. My own take, after looking a bit into the etymology of those words is that combining rite (which can mean “a way”) and write (which can go back to scrawling or carving on cave walls), can mean that writing is actually carving a way forward. At least it is for me. Light a candle and make a list of hopes or intentions for the writing space. Then turn on music you love, and clean the space. Dancing while cleaning is always helpful. When you’re done cleaning, put something or things in the space that inspires you—flowers, art, etc (amongst other things, next to my writing desk I have a piece of art by my friend Ashley—it’s a line drawing of a little girl looking up at a beautiful big globe and the title is “and the weight of the world felt light in the air”). To conclude, make a list of all that you’re grateful for in terms of your writing—people who have helped or inspired you, life experiences, gifts, etc—and read it out loud. Gratitude and acknowledgement are powerful tools. Our words are also powerful, and sharing them in our spoken voices adds an extra kapow. Blow out the candle and eat/drink something to ground yourself. Make a point in the next few days of reaching out to someone you’re grateful to and say so. Thank you so much, Sara, for such wonderful questions and for giving me the space to respond. You are a gift. Pamodpa. SR: My pleasure! Pamodpa, y’all. And if you’re in Portland, come on over to A Children’s Place on Wednesday at 7 pm, meet Jen, and get your very own Pamodpa! Two futile wishes Well, hello. Two books I recommend, with titles that start with M.
Back in my paramedic days, we transported bodies to the mortuary pretty regularly. Morticians and funeral directors are really nice people. I really believe most of them get into that line of work because they honestly see it as helping people. And if you show that you’re not horrified by their job, they can be incredibly chatty. I can absolutely see that. And talk about a profession where you see people when they’re at their most vulnerable — the live ones, I mean; the dead ones are, of course, past all that.